Do you have a chipped, broken, or stained tooth? Dental bonding might be the treatment option for you because it provides a successful attachment between the filling material and the tooth’s original enamel and dentin where little or no tooth reduction is needed. Dental bonding is a cosmetic dentistry procedure in which tooth-coloured material is applied and hardened with a special light to a tooth, sculpted into shape, and polished to restore or improve a person’s smile. Restore chipped or cracked teeth. Improve the appearance of stained teeth. Change the form of teeth making it look longer. Save a tooth’s root that has been exposed when gums recede. Preparation. Minimal preparation is required for dental bonding. Anaesthesia is not usually used except if the bonding is being utilised to fill a rotted tooth. Your dentist will utilise a colourmanual to select a composite resin colour that will intently match the colour of your tooth. The bonding processes. Next, the outside of the tooth will be roughened and a conditioning fluid is applied. This will help the bonding material cling to the tooth. The tooth-shaded, putty-like tar is then connected, moulded, and smoothed to the ideal shape. A brilliant, normally blue, light, or laser is then used to solidify the material. After the material is solidified, your dentist will additionally trim and shape it and clean it to match the sheen of whatever is left of the tooth surface. Time-to-finishing. Dental bonding takes around 30 minutes to one hour for every tooth to finish. 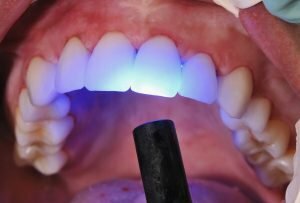 Since dental bonding is more vulnerable to decolouring and chipping than different types of restorative dentistry, unique care is required to keep your bonded teeth looking natural. Reduce the intake of coffee, tea, and red wine. In case you’re a smoker, this is a valid reason to stop — also note that smoking additionally expands your danger of gum disease and oral cancer. Since dental bonding can chip with ease, abstain from biting your nails or chewing on hard items, for example, ice, pencils, and crude carrots. Call your dentist in the event that you see sharp edges or if your teeth feel weird when you bite down. Dental bonding might not be the best option in all circumstance, however, it very well may be a speedy and moderately reasonable approach to enhance your smile. And feeling the presence of your sparkling whites can enable you to maintain great dental health. When it comes to dental bonding, count on DonEast Supreme Dental. Our dentist and staffs are dedicated to providing top-notch high-quality dental services to patients across communities in Nunawading, Balwyn North, Box Hill, Blackburn North, Box Hill North, Templestowe.